to a traditional story that was just handed down for so many generations that its origin is lost in the mist of time. As with Cinderella, however, Disney chose a story old enough to be in the public domain, which obviated any problems that might otherwise have stemmed from copyright conflicts. But just like Winnie the Pooh, the fact that all necessary authorizations (in this case, none) had been made didn't prevent a storm of criticism based on the fact that it was altered and "disneyfied" far beyond levels the critics considered acceptable, including but far from limited to butchery of the traditional accompanying artwork, in this case by Sir John Tenniel. Even Disney himself criticized it, but not for its departure from the original. He considered it to lack sympathetic characters, such as Alice herself (unrelated to the Alice from early in Disney's career), who wasn't very likable in Lewis Carroll's 1865 story, either, or in its 1872 sequel. There's also the problem of condensing the entire Alice corpus into a 75-minute movie, always difficult when converting prose to film but especially so when the prose work is large and complex, laden with nuances that intrigue adults every bit as much as they do children; and the filmmaker, for all his virtues, is not known for the subtlety of his nuances. It may be that the problems with Disney's Alice in Wonderland stem mostly from the fact that Disney and Carroll were both creative geniuses whose works strongly represent their own sensibilities, and any given story generally has room for only one. Nor was Disney the only one who criticized its faithful aspects. It was generally thought at the time that it departed too much from realism, something Disney cartoons (as opposed to, say, those of Tex Avery) tended not to do. But earlier adaptations of Alice into performance media were often thought necessarily deficient because of the unfortunate circumstance of being rendered by live actors, and therefore unable to do full justice to the story's surrealism. This general attitude, that Alice in Wonderland should have been more realistic, may have been responsible for the film's lukewarm reception at the box office. It wasn't until the late 1960s, while Fantasia was finding acceptance by a less reality-bound newer generation, that it began to show a large profit. Be that as it may, the Disney version contained a great deal of Carroll's Alice, from the White Rabbit who led her into the alternate reality, to a complete animated version of "The Walrus & the Carpenter". 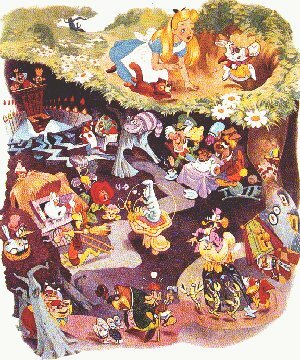 In fact, Alice in Wonderland had more speaking characters than any other Disney feature. However, much was missing as well, including a true adaptation of the most famous narrative poem to appear as part of the story, "Jabberwocky" (tho The Cheshire Cat did recite a few lines of it). Voices in Alice in Wonderland include Kathryn Beaumont (Wendy in Disney's Peter Pan) as Alice, Sterling Holloway (Sugar Bear in commercials but not in Linus the Lionhearted,) as The Cheshire Cat, Verna Felton (Aunt Sarah in Lady & the Tramp) as The Queen of Hearts, Dink Trout (Bootle Beetle in several Donald Duck cartoons) as The King of Hearts, Bill Thompson (Droopy) as The White Rabbit, Ed Wynn (Uncle Albert in Mary Poppins) as The Mad Hatter, and Joseph Kearns (almost exclusively a face actor) as the only original Disney character in the whole movie, the Talking Doorknob. Tho it didn't do extremely well at the box office, Alice touched off its share of merchandising, including the occasional adaptation into other story media, such as Little Golden Books. It was serialized in Sunday newspapers, as a revival of Disney's Silly Symphonies Sunday series. Dell Comics published an adaptation of it, which was reprinted several times by Dell and Gold Key Comics. Alice's Mad Teacups is a very prominent ride in Disneyland's Fantasyland section. Later cartoon adaptations of Carroll's Alice include a comic book in the Classics Illustrated Junior series, which is still traded in the collector market, and a 1966 Hanna-Barbera TV cartoon special, which critics don't seem to have liked very much. Unlike many other Disney features, Alice in Wonderland has had no straight-to-video sequels in recent years. Text ©2006-10 Donald D. Markstein. Art © Walt Disney Productions.